Confit sounds fancy, right? But it’s not. Check out this recipe on epicurious.com. Confit is a French term for “various kinds of food that have been immersed in a substance for both flavor and preservation.” This cherry confit is perfect for tofu because it adds a huge flavor punch. I keep the sides simple so they don’t compete with the confit. Super delicious and filling! Note: the cherries require a 30 minute soaking time so be sure to leave yourself enough time or prepare the confit ahead of time. Soak the cherries in the vinegars for 30 minutes. Thinly slice the shallots. Add them and the olive oil to a pan with sides. With the heat on medium, cook the shallots until soft. Sprinkle the shallots with the sugar. Cover and cook, stirring occasionally, for 10 minutes. The sugar will get bubbly and start to caramelize the shallots. Add the cherries, along with the vinegars, to the shallots and simmer uncovered until almost all the liquid has evaporated. Season with salt and pepper. Cut potatoes in half. Toss with olive oil and salt and pepper. Roast in 400 oven until browned, about 30 minutes. Peel and slice the carrots on the bias. Cover in a small pot with water and a bit of salt. Bring to a boil and cook until just fork tender. Drain the carrots and add back to pot. Mix in Earth Balance, agave, and lemon juice and heat through until a glaze forms. Press the tofu for as long as you have time for. Cut into 4 pieces (cut in half and then cut the halves in half again.) Heat oil in a non-stick skillet. When hot, add the tofu and sear on the first side and then flip for the second side. 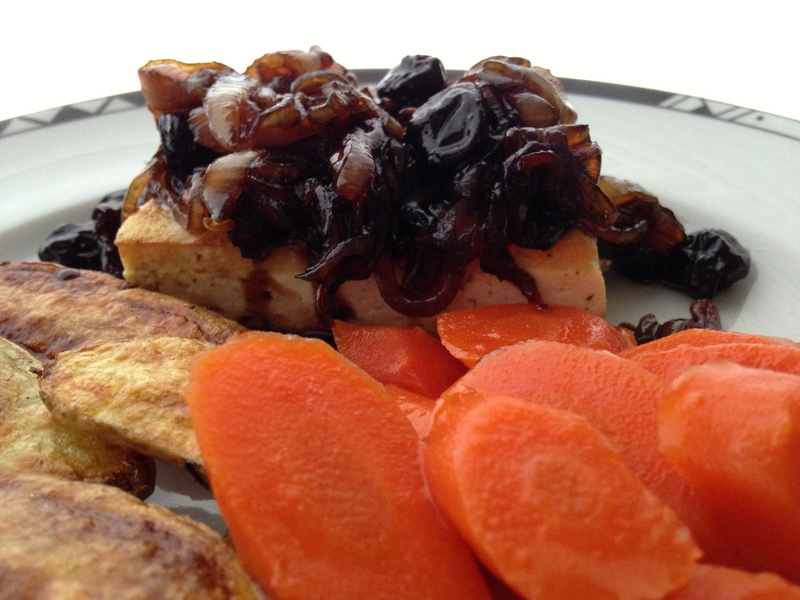 Place the tofu on the plate and top with the confit. Add carrots and potatoes. Enjoy!